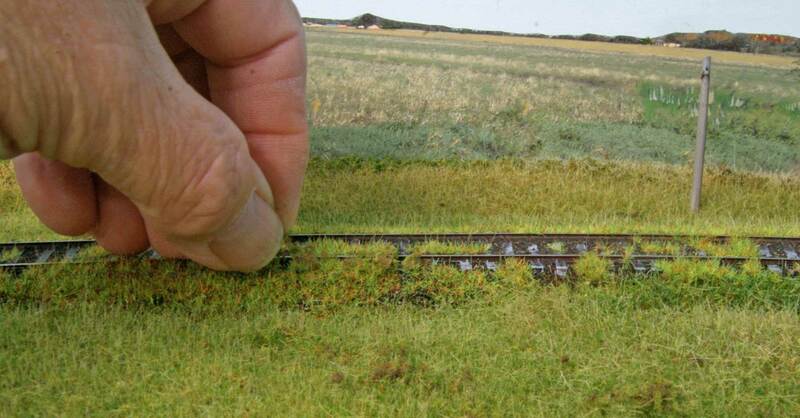 I’ve always ballasted my track before adding the surrounding scenery. 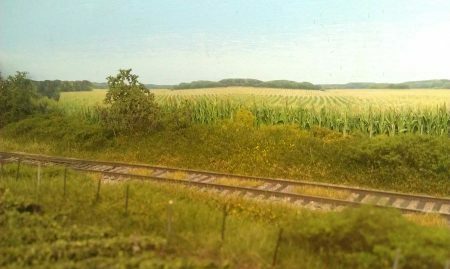 Because of the way I chose to build a U-curve for my M&StL Story City, Iowa, branch layout, I left the track until last. 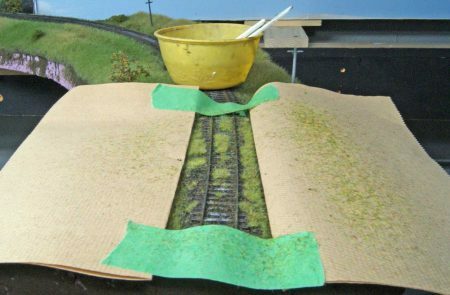 I did glue down Cascade Rail Supply Homasote roadbed before adding scenery. There were a couple issues I was concerned about. 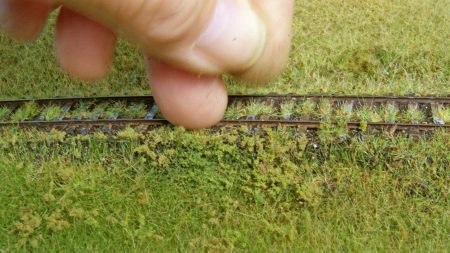 Not so much about ballasting but with adding weeds that seem to be a necessity when modeling a mid-century branchline. The two hurdles were how to keep the track weeds off the ditch weeds and how to blend the 2 mm track weeds with the taller surrounding grass. The standard approach to adding weeds is to dab on almost full strength white glue. I dab the glue along the center line of the ties and along the outside of the rails, and worked only about a foot at a time. I used paper towels taped together to block track weeds from contaminating the ditch grass. 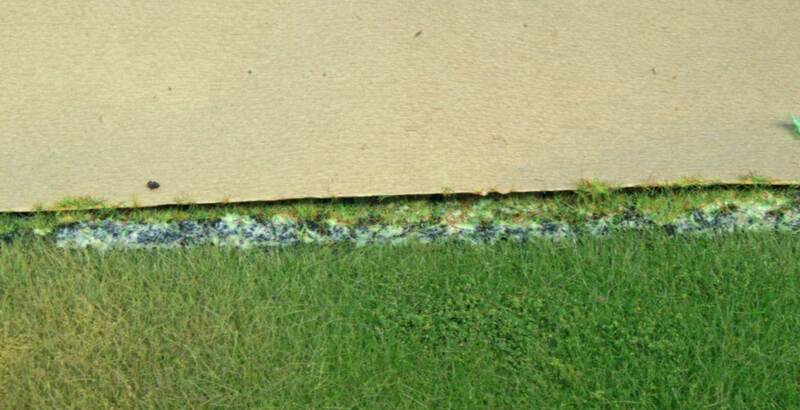 You can see the grass over spray caught by the paper towels in this photo . I did not use any wetting agent before applying the grass. 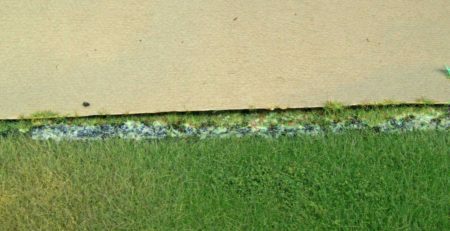 Doing so would dilute and spread the glue causing a total loss of control in the grass application. 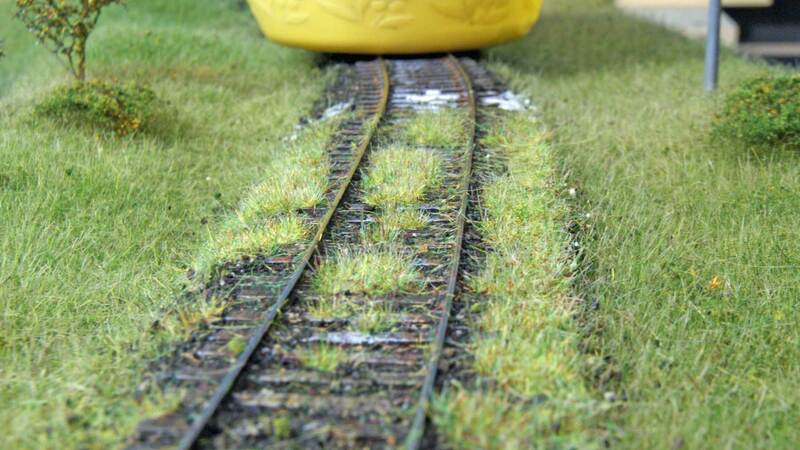 Here’s a close up of the track weeds after vacuuming with a dedicated vacuum. 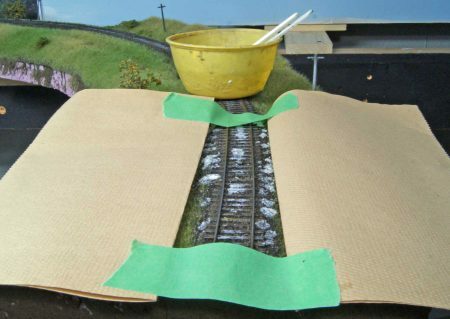 You can see the seam between the Scenic Express 2 mm bulk bag used between the Code 55 rails and the longer Silfor 6 mm mix used on larger areas. I again used a paper towel to protect the track grass from the application to blend the seam. I brushed on more diluted glue into the seam area and used a combo of Silfor 2 mm and 4 mm to blend. 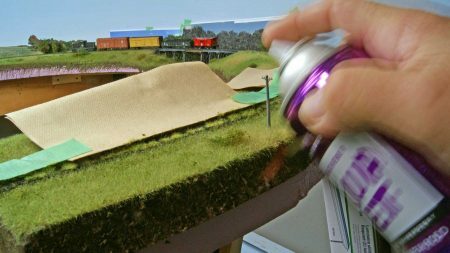 For the side of the track closest to the fascia, I used cheap hairspray as a fixative. When done installing the grass, it was time to detail it. Most guys would finish at this point, but it looks so much better after adding leafy material. First, spray hairspray along the outer edge of the track then grab a pinch of Woodland Scenics course foam between your thumb and first finger and lightly drag the clump along the tops of the tallest grass. If too much drops, just push it farther away over and into the ditch grass. 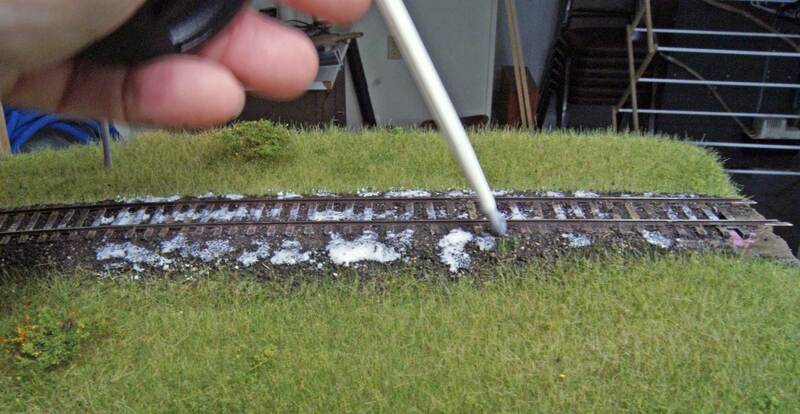 Step two is to sprinkle Blended Turf over the now bushy grass and any bare spots between the rails. Then hit it all again with the hairspray. Here is a look at the completed weeds applied to half of the curve. 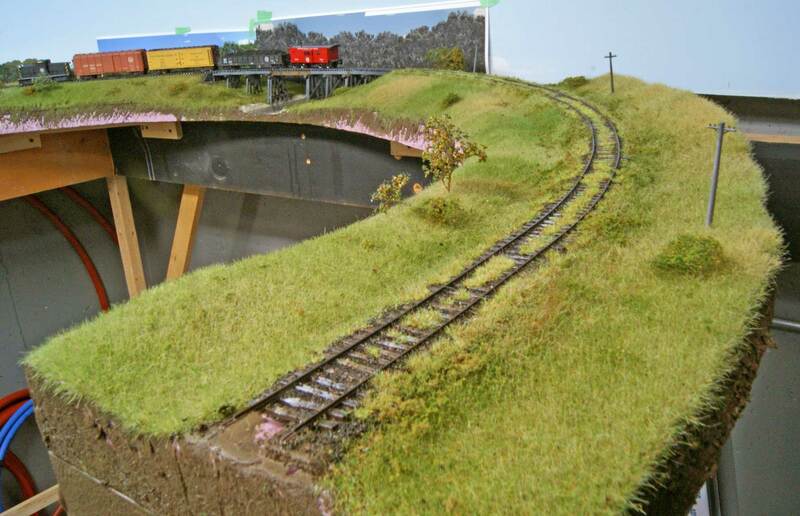 All this comes together in the end to make the latest scene for the new Story City Branch layout. I take no credit for the techniques I used. I think modelers sometimes travel in parallel universes. We unwittingly come up with very similar ideas. I picked these up from Jason Klocke while watching him do the track on his CGW layout, the real Great Weedy, as seen above. We thank Clark for sharing his latest scenery work. It certainly inspires us to push scenery work forward in the coming months. Real nice work! Thanks for taking the time for sharing it with us – I know that’s extra ‘work’ but it’s a great way to promote and share techniques. Great blend of the various static grass sizes. Well done! Super Job Clark! Always like to see your work. Clark, your track and layout look fantastic. 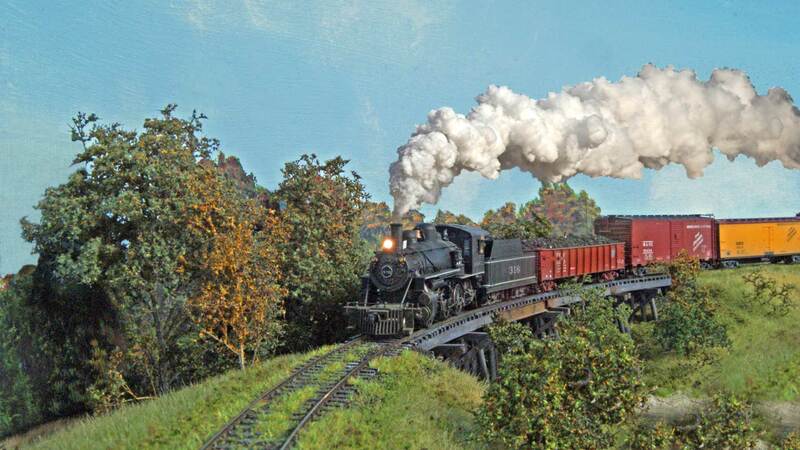 Nice looking train also.